SensorTec's complete line of Resistance Temperature Detectors (RTD's) offer an unparalleled combination of quality, performance and price to meet todays changing market. To meet a broad range of requirements, SensorTec has designed RTD's in three specific temperature ranges: the "L", "M", and "H"
The "L" Series construction provides a cost effective and durable probe suitable for industrial process or laboratory applications and offers high accuracy, long term stability, superior interchangeability and resistance to shock and vibration. The "M" Series utilizes the same basic construction as the "L" series, but offers the benefit of an extended temperature range. High accuracy, long term stability, superior interchangeability and resistance to shock and vibration make this series a significant addition to our line of high quality RTD's. 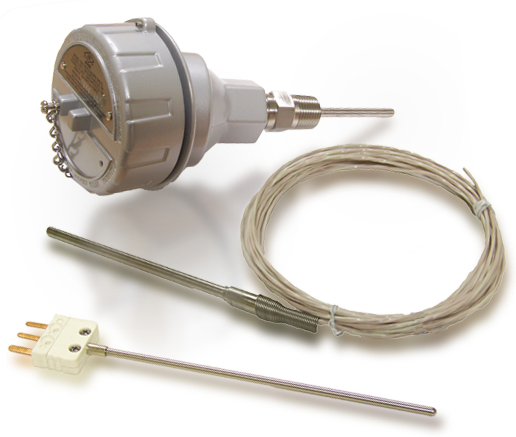 The "H" Series construction utilizes a fully supported, strain free wire wound sensing element encapsulated in a compacted MgO insulated metal sheathed cable. This combination provides a probe suitable for extremely demanding applications. It offers superior resistance to pressure, shock and vibration. By utilizing the finest elements available, this style of probe displays long life, long term accuracy and excellent repeatability.